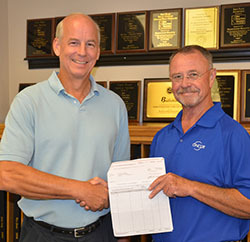 The Brownwood Area Chamber of Commerce Total Resource Campaign (TRC) is their annual sponsorship drive. Volunteers sell sponsorship opportunities to area businesses to not only help promote local business, but to support the Chamber of Commerce events and activities. The campaigns are being led by Ken Harriss and Daniel Hutson with the theme of “And Then Some” in the memory of Dr. Don Bostic who passed away in 2015. The TRC is designed to give Chamber members numerous opportunities to become more involved with the Chamber on various levels through greater public awareness of Chamber programs, projects and events. In addition, the TRC makes it easier for businesses to budget for the coming year and helps improve the efficiency of Chamber-sponsored events. Volunteers will be contacting local businesses during the six-week campaign looking for support for these sponsorship opportunities. Volunteers earn prizes as they work through the campaign. Through the Total Resource Campaign, the Chamber staff reviews and evaluates current programs and develops a menu of sponsorship opportunities tailored to fit any budget, big or small. Over a six-week period, local volunteers will work with Chamber members to design an ideal sponsorship plan for the entire year. The TRC is designed to be fun and exciting for team members with rewards available throughout the campaign. Throughout the United States, Total Resource Campaigns are gaining support and popularity among progressive chambers of commerce and have been embraced by chamber members, board leadership and staff because of the beneficial nature of the campaign. For more information about the campaign, call the Brownwood Area Chamber of Commerce at 325-646-9535 or email membership@brownwoodchamber.org. CLICK HERE to follow the progress of the current Total Resource Campaign.